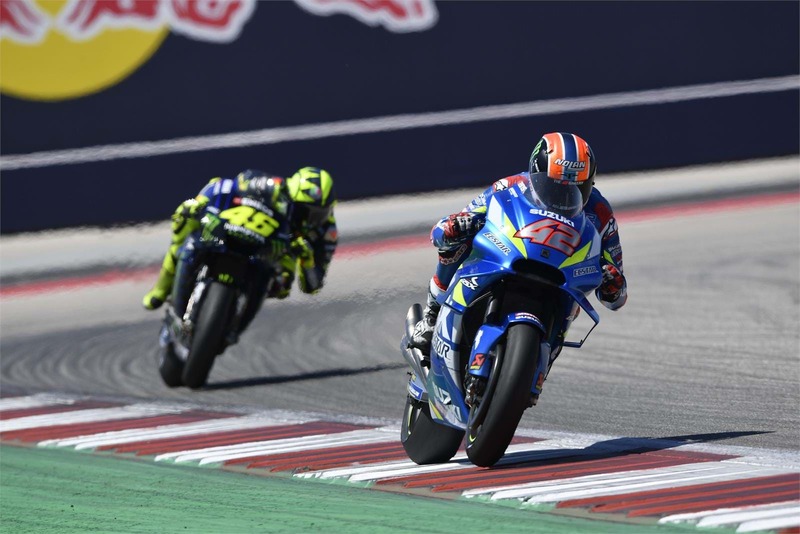 Alex Rins secured his first ever MotoGP win at yesterday's American Grand Prix, winning aboard his Suzuki GSX-RR at Circuit of the Americas in Austin, Texas. 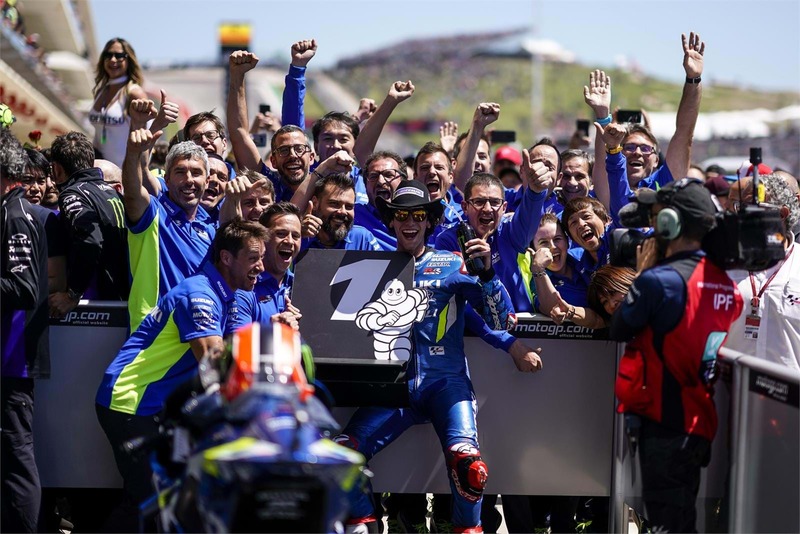 In a drama-packed race Rins went about his business with an air of calm and control, looking comfortable and composed as he progressed from his third row grid spot to join the podium battle. 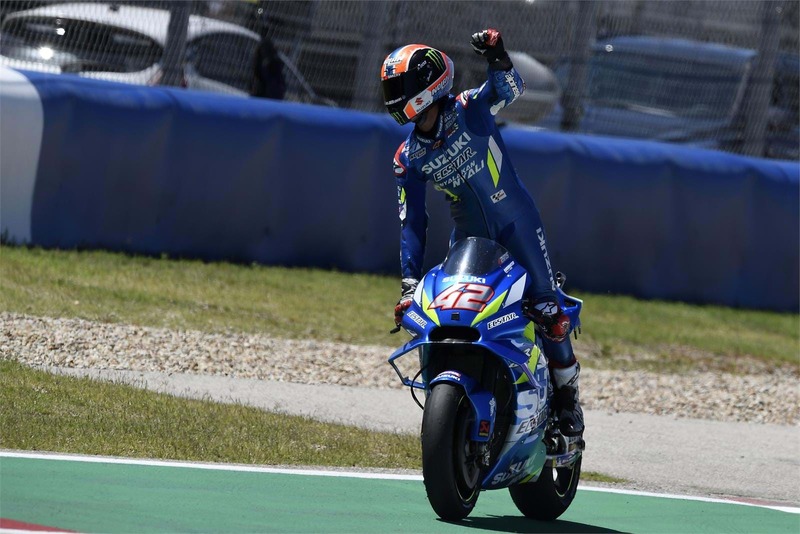 Settling into a rhythm as others around him made mistakes of varying severity, the Suzuki-mounted Spaniard sat second in the closing stages, stalking race leader Valentino Rossi before executing a clean, well-planned pass for the lead. After dodging a late lunge from Rossi, who sought to retake the lead, Rins put his head down and steadily stretched his advantage at the front to remain out of striking distance of his rival. He kept it clean and played it cool to cross the line ahead and take his first MotoGP win, backing up his late-season form from 2018, his strong preseason, and two solid races at Qatar and Argentina. He said of his debut win, "It’s incredible, I’m very happy to win the race here. In warm-up in the morning we tried a different setup and it didn’t work in the way we expected, so we reverted to the usual settings for the race and we won. It’s super! I’m lost for words! "I managed the pressure well, even though I suffered a bit in the last laps. When I crossed the line all the feelings hit me at once. I just want to say a big thank you to all my team, everyone in Japan, and all the people around me." Team manager Davide Brivio commented, "We are so happy - so pleased for the factory back in Japan and for all the team staff, because everybody has worked so hard. And it’s wonderful for Alex, this is further proof of the way he’s matured and improved. "When he began with us he suffered a lot with injuries, and since then he has worked so hard and this achievement is something he really deserves. Now I can say that our target this season was victory, and we’ve done it at the third race. Thanks to all the Suzuki staff and Alex." The GSX-RR MotoGP racer is the thoroughbred racer with which the GSX-R1000R shares much of its DNA, utilising the GSX-RR's variable valve timing system to boost low-down torque and peak power, plus a suite of electronics that includes launch control, quickshifter and auto-blipper, and a 10-stage, lean angle-sensitive traction control system. It is also currently available on 0% APR finance and is available for £159 per month (plus optional final payment), with a deposit of £2,916. For more information on the offer, click here. GSX-R1000R £159 per month based on 37 months PCP Finance, 6,000 miles per annum, customer deposit £2,916 and optional final payment of £8,005. HP Finance also available. Credit is available to UK residents aged 18 and over, subject to status. Suzuki Financial Services Limited, St William House, Tresillian Terrace, Cardiff, CF10 5BH.